Flexing like the lens of a mad eye." 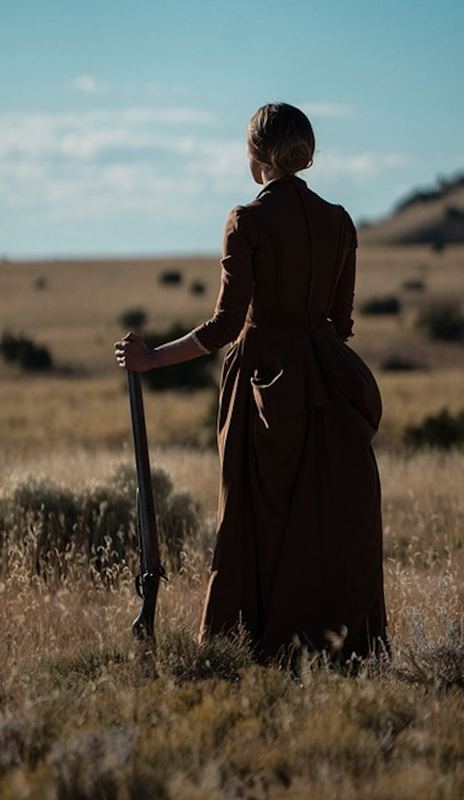 It's hard not to turn right to poetry (that there of Ted Hughes) in an effort to capture The Wind, director Emma Tammi's oft-silent new western of feminine survival in ye olden days -- the movie is all sound, flickering light, and the sudden fury of sentences crashing down, spattered like wet dirt on the hem of a fine dress. 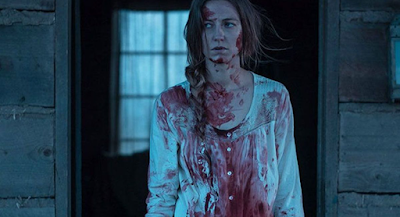 Our leading lady Lizzy (a fierce Caitlin Gerard), left alone on the range for longer spells than her mind can manage, begins twisting in that eponymous breeze -- time unravels, a pile of yellow yarn left piled in the corner of a wooden bunker, dotted with spectacular buttonry. Please do note how I keep coming back to costuming -- The Wind is a solid horror film about disintegrating sanity that at times too confuses itself and us in its shuffle between the past and the present (although even more solid when you understand it's Tammi's first film -- this is the sort of first film that has you dying to watch the director's second). 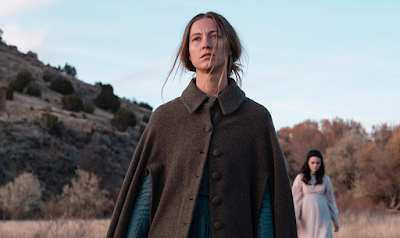 But the film's exquisite costuming (from designer Kate De Blasio) often raises it up from solid to outstanding -- at every turn it eschews the obvious, turning our Sarah Plain and Tall expectations against themselves. Lizzy's costumes have the flair of someone with way too much time on their hands and too many needles tucked into their hair -- none of the costumes are boring, even the neighbors have their oomph (you know to beware the new girl the second you see her pink dress lined with the blackest of ribbon) and Lizzy's husband (Ashley Zukerman) is always outfitted to best accentuate his comely cowboy curves. But Lizzy's fragile mental state begins expressing itself across these strange too-expensive-seeming dresses -- mad fits of clustered buttons, vicious ruffles and bustles; lines out of their time. It's all there in those sordid hems if you're just willing to see the lady-stuffs spilled before you. The soundtrack too is particularly fine -- I don't remember a moment of particular silence, stillness, only the rigorous whispers of the prairie's dark thoughts in my ears. This, it insinuates, is what relentless loneliness sounds like -- an indecipherable circus of voices crowning at the doorstep in an unending and cruel-seeming, threat-making hum; something high and melodic to harm ourselves and our best loved ones to. The dark is a song and we sing, sing for supper. Din din.